WASHINGTON, DC, June 1, 2010 (ENS) – In a legal settlement that could affect the entire U.S. meat industry, the Environmental Protection Agency has agreed to identify and investigate thousands of factory farms that have been avoiding government regulation for water pollution with animal waste. The settlement requires the agency to propose a rule on greater information gathering on factory farms within the next 12 months. It will require the approximately 20,000 domestic factory farms to report such information as how they dispose of manure and other animal waste. The Natural Resources Defense Council, Sierra Club and Waterkeeper Alliance filed the suit in 2009 over a rule that exempted thousands of factory farms from taking steps to minimize water pollution from the animal waste they generate. “Thousands of factory farm polluters threaten America’s water with animal waste, bacteria, viruses and parasites that can make people sick,” said Jon Devine, an attorney with the nonprofit Natural Resources Defense Council. “Many of these massive facilities are flying completely under the radar. EPA doesn’t even know where they are,” said Devine. More than 30 years ago, Congress identified factory farms as water pollution sources to be regulated under the Clean Water Act’s permit program. But under a Bush administration regulation challenged by the environmental groups in this lawsuit, large facilities were able to escape government regulation by claiming, without government verification, that they do not discharge into waterways protected by the Clean Water Act. Under the settlement reached May 26, the EPA will initiate a new national effort to track down factory farms operating without permits and determine if they must be regulated. The specific information that EPA will require from individual facilities will be determined after a period of public comment. But the results of that investigation will enable the agency and the public to create stronger pollution controls in the future and make sure facilities are complying with current rules. Factory farms, also known as concentrated animal feeding operations, CAFOs, confine animals on an industrial scale and produce massive amounts of manure and other waste that can pollute waterways with dangerous contaminants. These CAFOs apply liquid animal waste on land, which runs off into waterways, killing fish, spreading disease, and contaminating drinking water. The plaintiff groups cite EPA estimates that pathogens, such as E. coli, are responsible for 35 percent of the nation’s impaired river and stream miles, and factory farms are one of the most common pathogen sources. “This agreement sets the stage for new Clean Water Act permitting measures that will add to producers’ costs, drive more farmers out of business, increase concentration in livestock production to comply and hurt rural economies,” said Randy Spronk, a Minnesota pork producer who heads NPPC’s environmental committee. “And the measures will do nothing really to improve water quality. Today there are more than 67,000 pork operations compared with nearly three million in the 1950s. 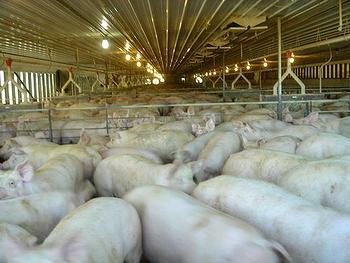 Farms have grown in size; 53 percent of them now produce 5,000 or more pigs per year. “We believe that the terms of this settlement will help reverse this industry’s history of bad behavior by improving implementation and enforcement of the law,” Connor said. Litigation brought by these three groups has forced the EPA to revise its CAFO rules twice within the past decade to tighten the pollution control requirements on these facilities.